Friday nights at WestWaters are entertainment central thanks to the musical talents of Kate and Sarah from VAMP. Combining DJ sets with live performances, these beauties are the life of the party! We talk to them about their inspiration, their show, and each other! How did VAMP get started? Originally there were four of us in VAMP! Kate, Sarah, another one of our best friends Emma, and another friend Eliza. We all loved to sing, dance, and DJ, and wanted to create something that fused all three. We started off playing at festivals around Melbourne and we liked the name VAMP for many reasons. To “VAMP” up music means to make it sound better, and “VAMP” is also another name for “Femme Fatale”, which is a woman that is alluring but not because of her looks. How would you describe each other in 3 words? Sarah: passionate, determined, and talented. Kate: generous, driven, and fun-loving. What can WestWaters’ patrons expect from your show? Some great tunes and big smiles! We love all different types of music, from house to RnB. We love reading the crowd and playing for them. We are inspired by many artists. There are so many talented people out there. We love listening to RUFUS, Basement Jaxx, Scissor Sisters (especially live), and Goldfrapp. We love that we get to do what we love for a living. We get to go to “work” with our best friend and rock out to awesome music. We get to see people having the time of their lives burning up the dance floor on their night off. You’ve got a song coming out soon, please tell us about that and working with EVE. It was such a buzz working with EVE – she is so talented and gifted. She showed up to our studio session like a true rock star and definitely delivered on the day. “Neon Lights” will be released soon, so look out for it. If you could work with anyone, who would it be and why? Oh so many! Just to name a few: Madonna, Lady Gaga, Avicii, MJ (Michael Jackson) would have been awesome, and Scissor Sisters. 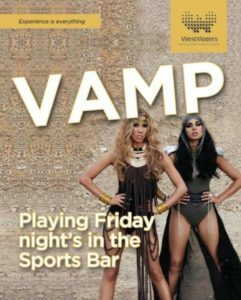 See VAMP at The Sports Bar, Friday nights from 8pm starting 10th February 2017.